Londoners are incapable of holding their tongues in public, according to a survey. 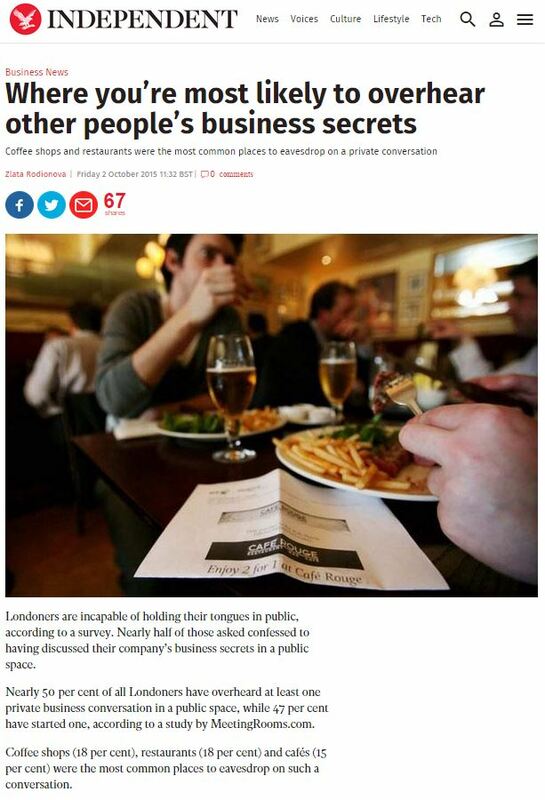 Nearly half of those asked confessed to having discussed their company’s business secrets in a public space. Nearly 50 per cent of all Londoners have overheard at least one private business conversation in a public space, while 47 per cent have started one, according to a study by MeetingRooms.com. “Whether it’s a competitor stealing your new product idea or an investor overhearing sensitive financial information, it’s clear from the study that while companies spend thousands, if not millions, every year protecting their data from hackers, their biggest data security threat is people sharing too much in a public place,” Mr Parker said. With so much privacy at risk, it’s a good thing MeetingRooms.com are here to remind us, with an entirely civic-minded motivation, that meeting rooms can be hired. This entry was posted in MeetingRooms and tagged Caleb Parker, independent, MeetingRooms, Zlata Rodionova on October 28, 2015 by Michael Marshall.